My friends are cool people. At least, I think they're cool — and I say things like "you're the cat's pajamas" unironically, so I definitely know cool when I see it. Even though I have the best besties a girl could ask for, though, sometimes I cannot help but envy celebrity BFFs. For instance: when I see how tight B.J. 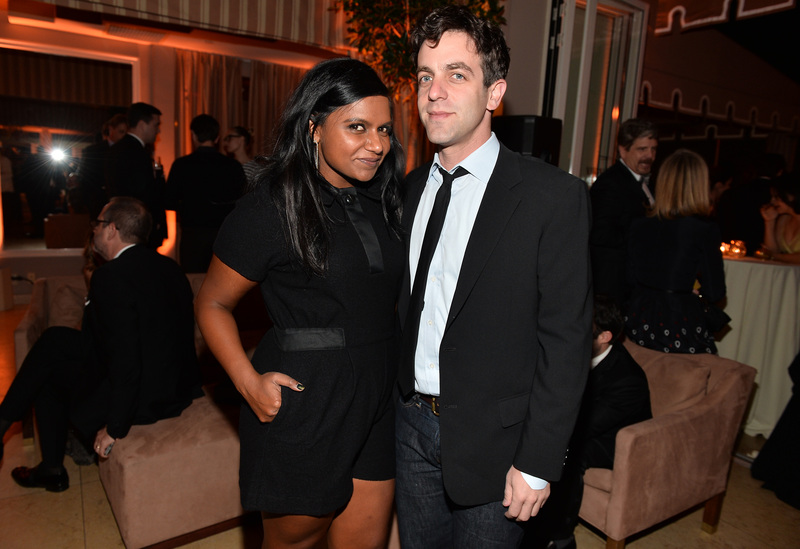 Novak and Mindy Kaling are, I can't help but feel, very deeply, that they are what the ultimate #squadgoals look like. I can't help it. Some celeb BFFs are so perfect it is nearly impossible not to want to crash their party in hopes of becoming the newest member of their crew. Let's face it, celebrity romantic relationships come and go, but celebrity BFF-dom lasts a lifetime. Usually. The celeb duos, trios, and more on this list help me set higher life goals for me and my friends. I know deep down in my heart, if we really put our minds to it, my posse could end up hosting the Golden Globes, writing a book together, or making a killer music video — I mean, these guys put their minds to it and achieved it! Kaling and Novak allegedly dated once upon a time ago, but now they are clearly forever friends. Not only do they travel together, tweet together, and help each other out when their books need promoting, now they are turning the story of their badass friendship into a book. That's not even the best part — they are writing it together. Kaling and Novak are proof that (reported!) romance does not have to end a great love story, because these two will clearly never fall out of like with each other. I can only speak for myself, but that is my ultimate squad goal. Poehler and Fey have hosted the Golden Globes together. Thrice. They've starred in a movie together. They were each other's cheerleaders on Saturday Night Live. They are so going to be family for life. Whenever Ripa and Harris get together on Live! With Kelly and Michael, good things happen. These two do everything together, including everything from going out for fancy dinners to taking their families on joint vacations to The Hamptons. They are the cosmopolitan BFFs of my dreams. Also, sometimes they just let loose and get totally silly, and that is the ultimate #squadgoal. Just look at the "Bad Blood" music video! That is what can be accomplished when you befriend every awesome lady in sight, a la Swift. I am definitely taking notes from her. If I can ever get to a point where I can say I have remained BFFs with someone for more than 20 years, then I will feel like I have lived a successful life. Duchovny and Anderson have been dogged by rumors that they were dating since their X-Files days, and every time they hang out in public, the rumors start again. The truth is these two just genuinely love being around each enough to show up at gigs to sing an encore when one of them starts a band. Jennifer Aniston, Lisa Kudrow, Matthew Perry, Matt LeBlanc, Courteney Cox, and David Schwimmer did not just play friends on TV — they became besties in real-life too. Not only did they stand together to make sure they all were paid equally back in the day, they still continue to support each other's projects and personal endeavors. Is there a more important squad goal than sticking to the "I'll be there for you" philosophy Friends was so fond of? I'm just going to let Plaza sum up why she and Kendrick's friendship is enviable. In an interview with Nylon magazine, Plaza said, "Hmm, hopefully when I’m 70, Anna Kendrick and I will have our multicam sitcom, exactly like The Golden Girls. We’ll just be two fast-talking sexual ladies hitting on younger guys." That is without a doubt the squad goal of all time.